Bushcraft is our primitive skills activity. 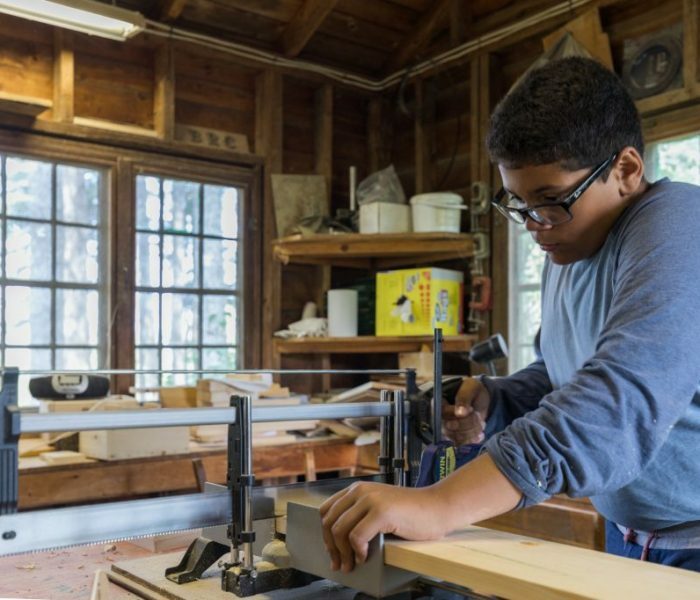 Boys learn about working with the resources and tools they have around them. They learn the basics of fire-building and a variety of ways to build a fire, including bow fires, flint & steel and more. As they advance, boys will learn more about axe use and safety and how to build their own latrines in the woods, etc. Bushcraft is about becoming comfortable in the woods and learning to use the resources that Mother Earth provides. Campcraft is about learning the skills of modern camping. The same skills that many of our trip leaders use when they lead trips. Like Bushcraft, Campcraft will teach fire-building, knife use and axe use but in a more modern format. 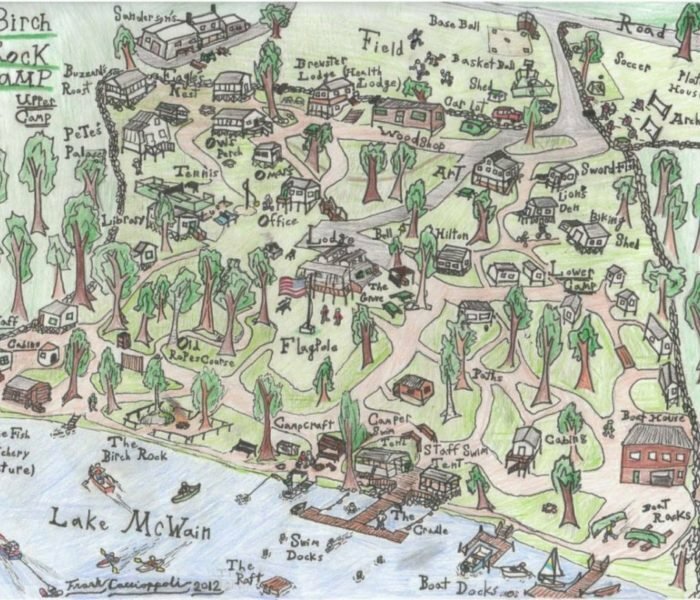 Boys will learn how to access the campsite, where to put up a tent, how to keep the food away from the animals, where to setup the latrine and more. The boys will learn the basics they will need to prepare themselves for our trips off campus. 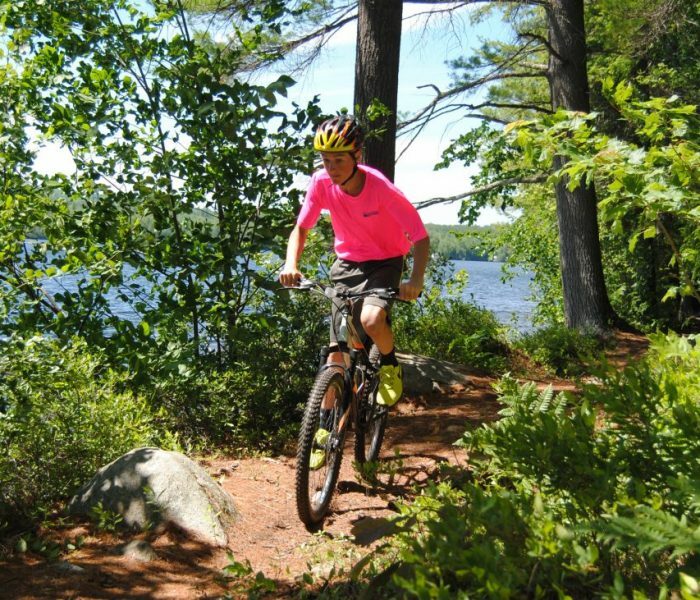 The boys who love this program the most will often go into the Junior Maine Guide testing and many will go on our Maine Wilderness Adventure trip when they reach the age of 14. 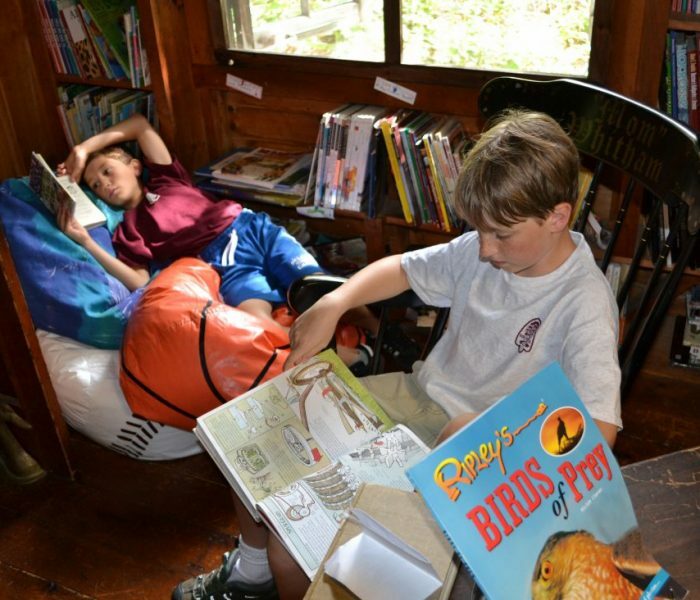 Our nature program is designed for the campers to learn how to observe and identify things they see all around them. The boys learn about the trees of Maine and the flora and fauna of the New England region. The Nature building houses a Lake McWain fish tank and a few frog tanks that many of the boys stock and care for themselves. The camp also has an arboretum of trees that the boys learn to identify around camp. 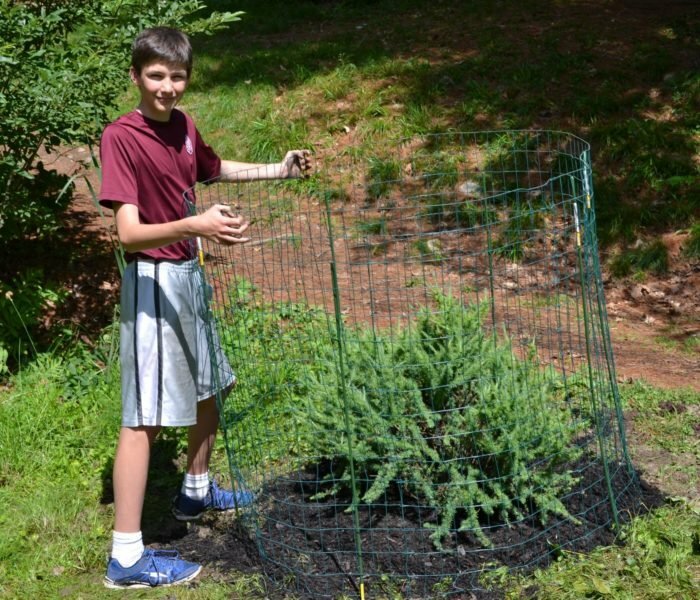 The top nature campers culminate their experience by planting their own tree somewhere on campus. Usually this new tree is of a species that currently does not exist on the grounds so future campers will have more trees to learn to identify. Archery is available to all ages and is extremely popular. The boys learn the terms of both the bow and the arrows. They learn the range commands for safety and how to stand and shoot. They will start by shooting at 15 yard target and work their way up to shooting at a target 50 yards down range. 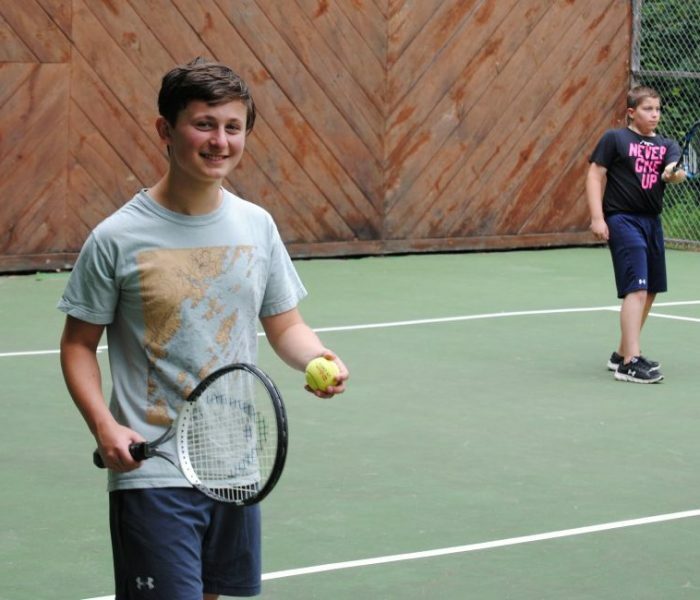 This activity is not available to our youngest camper activity group (boys 7-young 11). The next oldest group (Boys 11-young 13) will be allowed to sign-up for BB-guns and will learn basic rifle safety and all range commands. 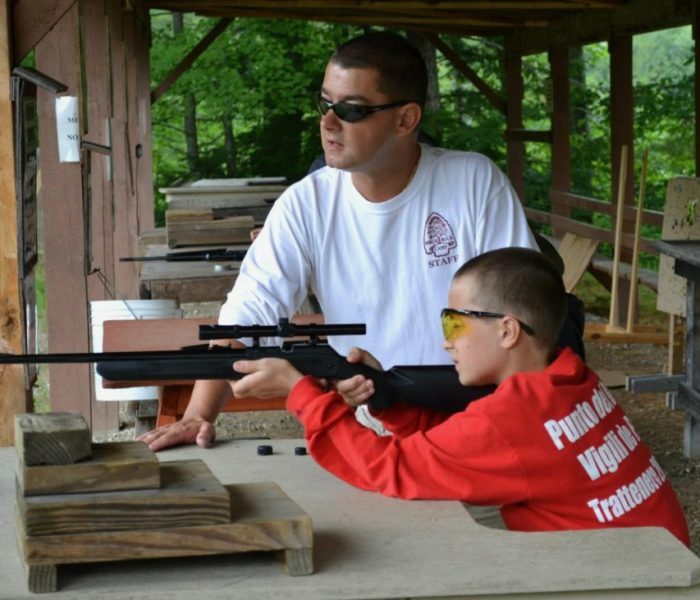 The two oldest activities groups (Boys ages 13-16) will go off campus to the local rifle range to fire rifles (.22s). They will learn gun safety and range commands and then shoot at targets set at a range based on their skill level. 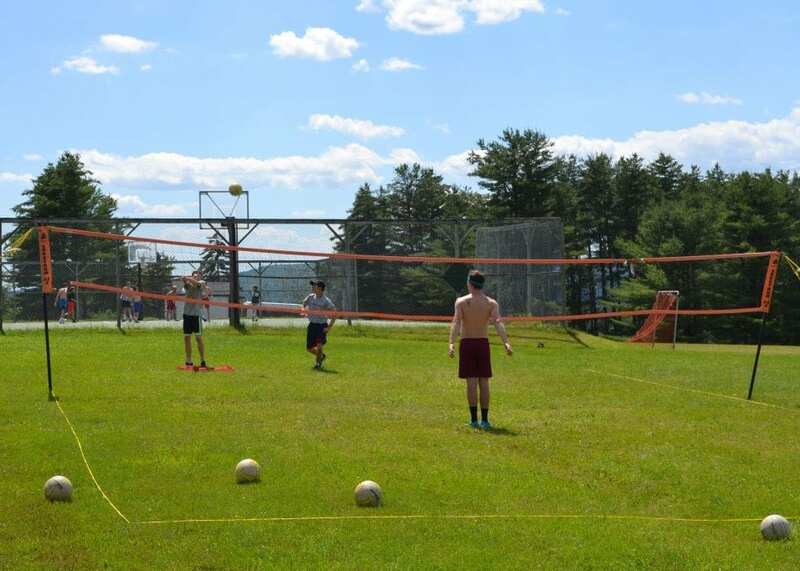 Volleyball has been at Birch Rock since 1989. 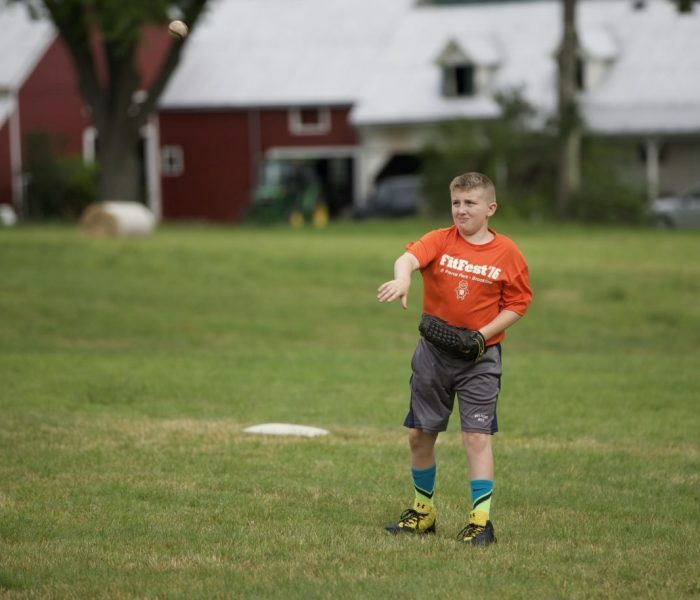 Our boys start out learning how to bump, set, pass and work as a team. As they improve they will work their way towards jumping and spiking, eventually then bringing it all together in game situations. Bushcraft is our primitive skills activity. Boys learn about working with the resources and tools they have around them. They learn the basics of fire-building and a variety of ways to build a fire, including bow fires, flint & steel and more. As they advance, campers will learn more about axe use and safety and how to build their own latrines in the woods, etc. Bushcraft is about becoming comfortable in the woods and learning to use the resources that Mother Earth provides. At Campcraft we focus on learning the skills of modern camping; the same skills that many of our trip leaders use when they lead trips. 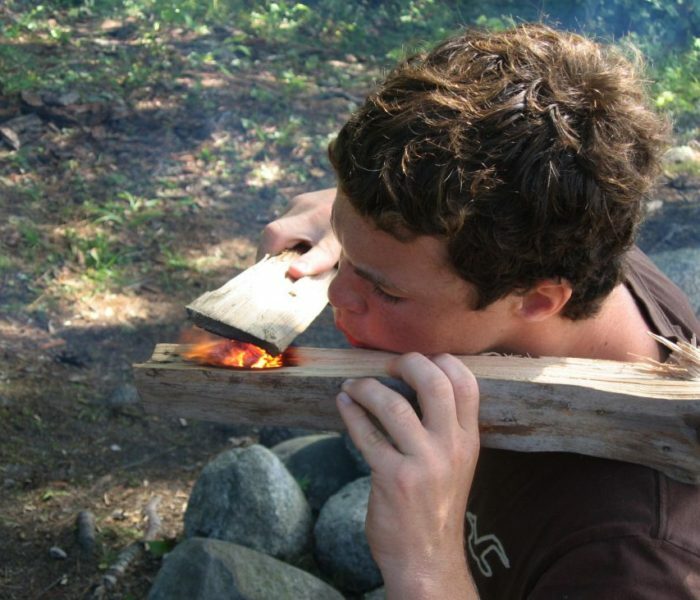 Like Bushcraft, Campcraft will teach fire-building, knife use and axe use but in a more modern format. Boys will learn how to access a campsite, where to put up a tent, how to keep the food away from the animals, where to setup the latrine and more. The boys will learn the basics they will need to prepare themselves for our trips off-campus. 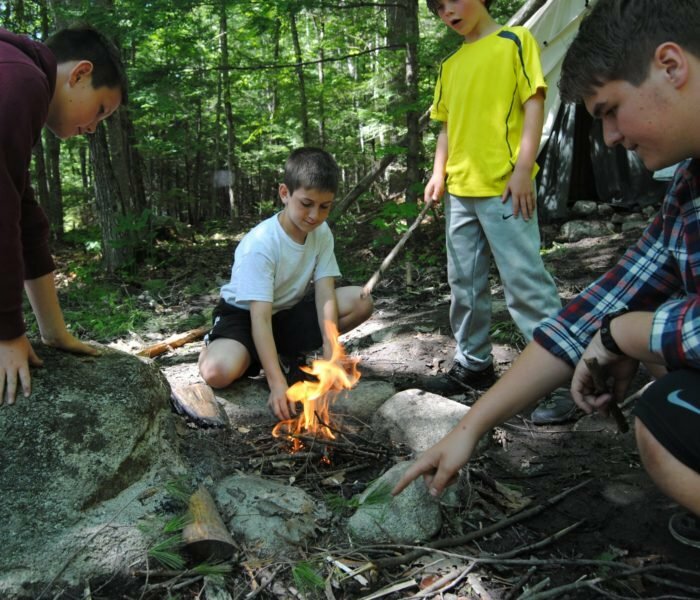 The boys who love this program the most will often go on our Maine Wilderness Adventure trip when they reach the age of 14, and many of those campers will try for their Junior Maine Guide certification at age 15 or 16. Archery is available to all ages and is extremely popular. The boys learn the terms of both the bow and the arrows. They learn the range commands for safety and how to stand and shoot. They will start by shooting at a 15-yard target and work their way up to shooting at a target 50 yards down range. This activity is not available to our youngest camper activity group (boys 7-11). The next oldest group (boys 11-13) will be allowed to sign-up for BB-guns and will learn basic rifle safety and all range commands. The two oldest activity groups (Boys ages 13-16) will go off campus to the local rifle range to fire .22 caliber rifles. They will learn gun safety and range commands and then shoot at targets set at a range based on their skill level. 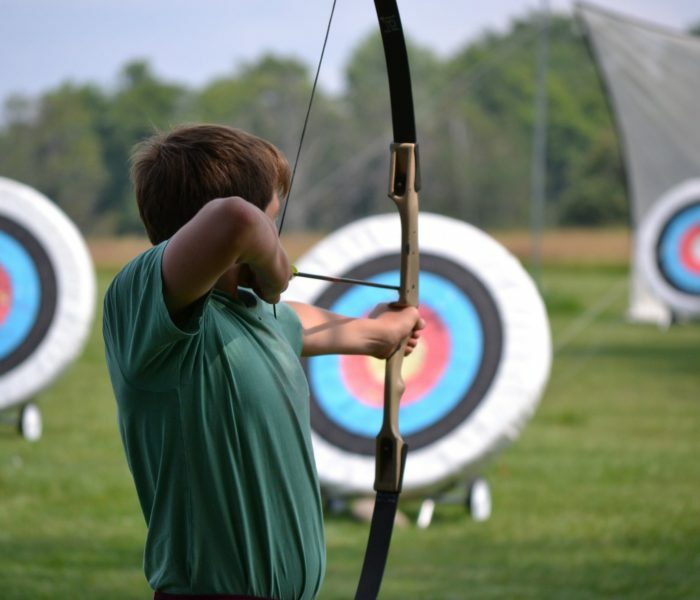 *Target Sports: We take our target sports very seriously and parents are required to give permission for our campers to participate in these activities. Canoeing has been at Birch Rock since 1926. 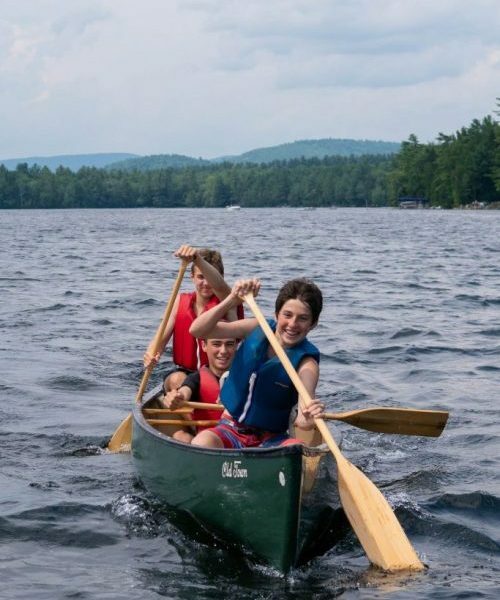 In addition to hiking trips, canoe trips are also extremely popular, and campers are required to learn some basic canoe skills before they go out on any canoe adventure. 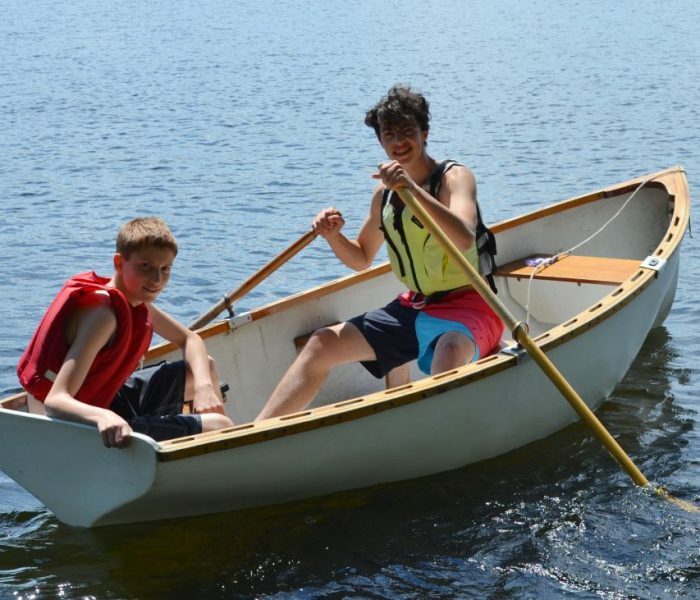 Most boys start out in the bow of the canoe, learning some of the basic strokes and taking commands from the sternman. Once they have the basic strokes down, they learn the sternman position and how to steer a canoe. Identifying parts of the canoe are reviewed early and often. Canoe safety and capsizing and recovery are also an important part of many of the classes. Swimming is a mandatory activity for campers for one hour every day. Swim classes are taught by Red-Cross trained Water Safety Instructors and their assistants. We take great pride in our campers learning the best swim skills possible and becoming comfortable in the water. 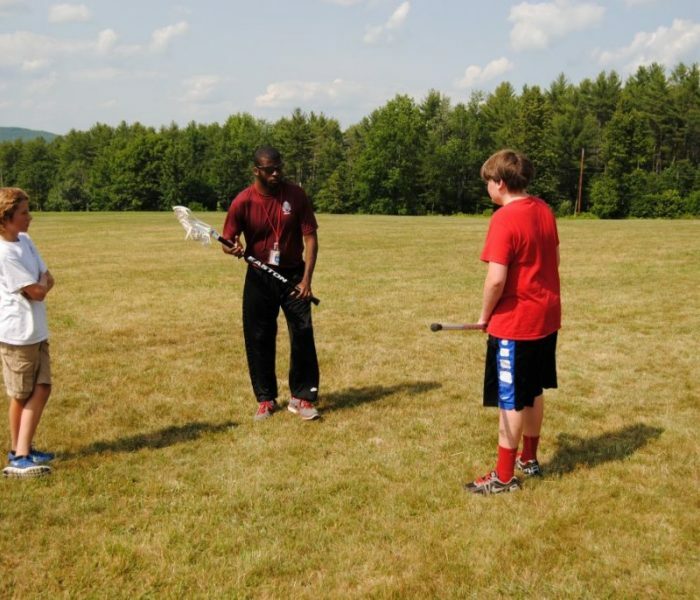 Campers will learn how to perfect their strokes, breathing skills, safety and more. Developing endurance is important as it prepares them for any long distance swims they may decide to take on. The boys are tested the first day of activities, then separated into groups based on swim skill level. Kayaking has been at Birch Rock for the last couple decades. 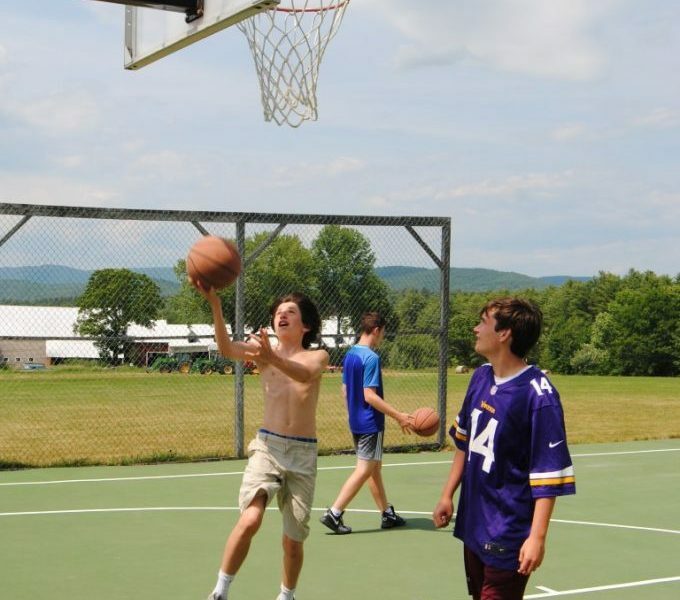 It is a relatively newer activity at camp and is very popular. 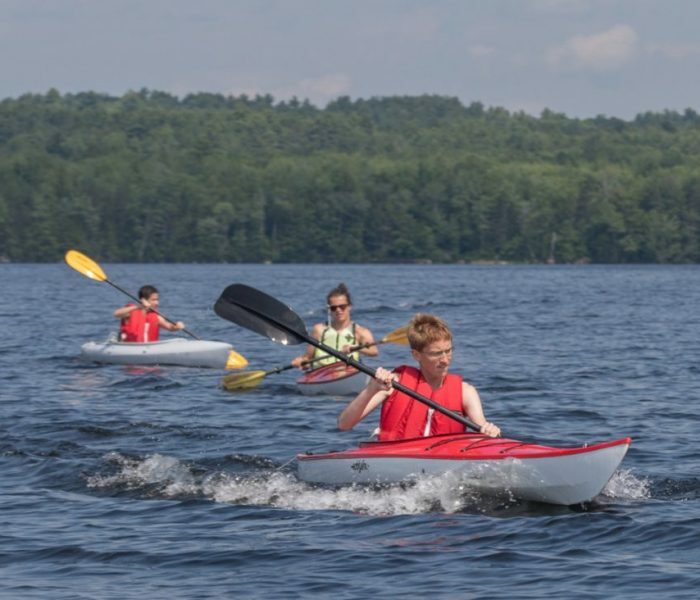 The camp has run a few kayak trips and any camper going on a kayaking trip must pass a basic kayak skills test. The boys love to glide around the lake in the kayaks and will adventure just about anywhere on the open water. It is always fun to see a loon pop up right next to your kayak when you are out in the middle of the lake! Boys learn many kayak skills, including strokes, parts of the kayak and constant safety review. Boating is a hugely important skill for any of our campers to learn. Our row boats are used for the long-distance swim program and for general safety and rescue. We love the campers who spend time picking up boating skills because it makes them more well-rounded staff members as they grow into our staff ranks. 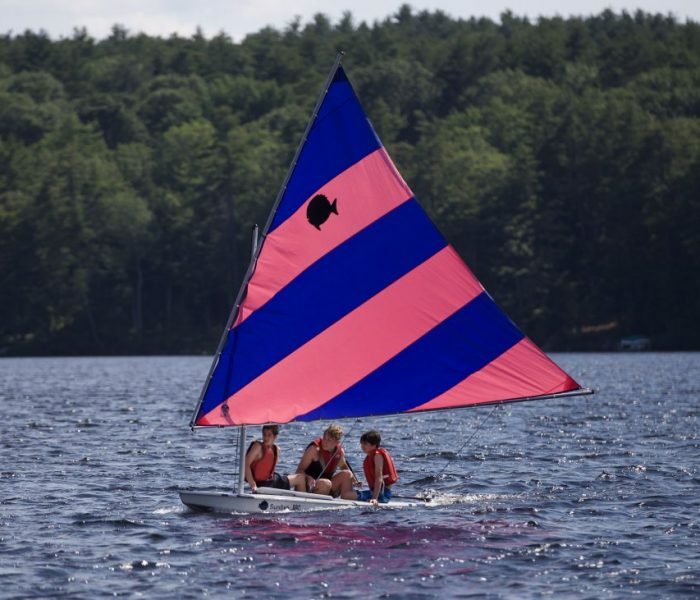 Parts of the boat and boat safety are learned early on, and as campers develop their skills we teach them how to comfortably and confidently maneuver in the water. Windsurfing is available to our oldest activity group only (boys 14-16 years old). The reason behind this is that the sails are rather difficult for a smaller boy to pull up out of the water. Our teenagers love to get out and surf the lake, buzzing right past the bigger sailboats. 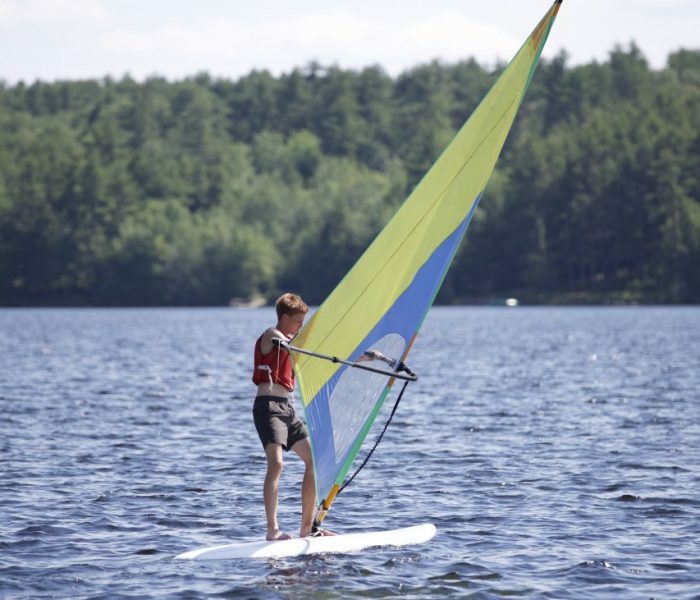 On days with no wind, the campers will take out paddle boards and work on balance. 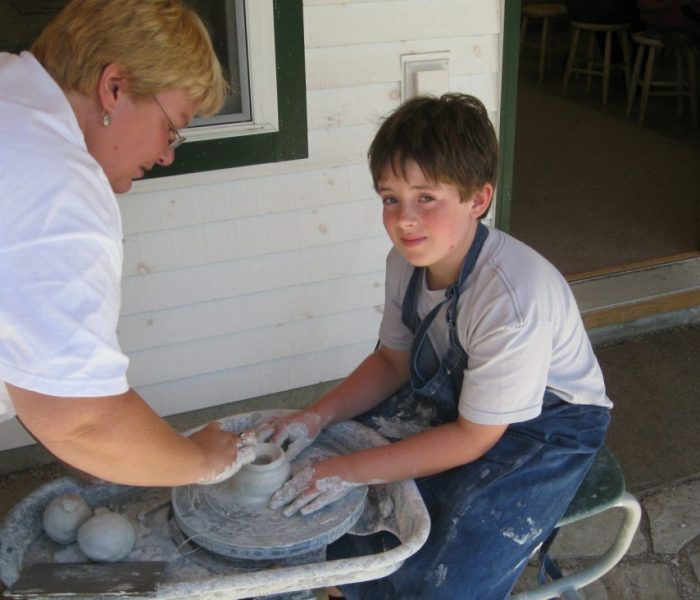 Art classes can take the children through many mediums. They learn painting and drawing, shading and patterns, the build puppets and construct bracelets, they make pottery and costumes for Saturday skit night, and more. Some days the instructors will guide them through a specific lesson and other days they get free run of the art room to make whatever comes into their creative minds. We hope every camper goes home with at least one thing they proudly made in Art. Want to make a bird house, pencil holder, book shelf or even a chair. Come to woodshop. The boys learn how to draw up a construction plan, sand and stain, cut, saw and drill, etc. All under the watchful eye of an experienced instructor. The camp has had miniature wooden car races and mini-sailing regattas over the years. You just never know what the instructor might have in store for the coming summer.